Baton Rouge, LA – August 27, 2014 – Lamar Advertising Company (Nasdaq: LAMR), a leading owner and operator of outdoor advertising and logo sign displays, announces that its board of directors has declared a quarterly cash dividend of $0.83 per share payable on September 30, 2014, to stockholders of record of Lamar’s Class A common stock and Class B common stock on September 22, 2014. As previously announced, Lamar expects to elect to be treated as a real estate investment trust (“REIT”) for federal income tax purposes effective January 1, 2014. To qualify for REIT status commencing with its 2014 taxable year, Lamar must distribute to its stockholders by the end of 2014 all of its pre-REIT accumulated earnings and profits, if any. In addition, as a REIT, Lamar will be required to distribute annually to its stockholders an amount equal to at least 90% of its REIT taxable income (determined without regard to the dividends paid deduction and by excluding net capital gain). Our REIT taxable income generally does not include income earned by our taxable REIT subsidiaries, or TRSs, except to the extent the TRSs pay dividends to the REIT. We expect to have net operating loss carry forwards, or NOLs, as of the effective time of our REIT conversion. To the extent we use these NOLs to offset our REIT taxable income, the required distributions to stockholders would be reduced. However, in this case, we may be subject to the alternative minimum tax. As a result of its expected REIT election, Lamar previously provided its expectations for the aggregate amount of its pre-REIT accumulated earnings and profits of approximately $40 million. Currently, Lamar’s board of directors does not expect to make a special distribution to its stockholders on account of its pre-REIT accumulated earnings and profits. We expect that the amounts declared and paid in connection with this dividend and the other regular quarterly dividends we have paid and expect to pay in 2014 will be in an amount sufficient to enable us to distribute our non-REIT accumulated earnings and profits no later than December 31, 2014. 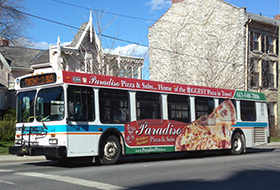 The amount, timing and frequency of future distributions will be at the sole discretion of Lamar’s board of directors and will be declared based upon various factors, a number of which may be beyond our control, including our financial condition and operating cash flows, the amount required to maintain REIT status and reduce any income and excise taxes that we otherwise would be required to pay, limitations on distributions in our existing and future debt instruments, our ability to utilize NOLs to offset, in whole or in part, our distribution requirements, limitations on our ability to fund distributions using cash generated through our TRSs and other factors that Lamar’s board of directors may deem relevant. There is no certainty as to the timing or amount of any future distributions. This press release contains forward-looking statements concerning Lamar Advertising Company’s goals, beliefs, expectations, strategies, objectives, plans, future operating results and underlying assumptions, and other statements that are not necessarily based on historical facts. Examples of these statements include, but are not limited to, statements regarding the current estimate of pre-REIT accumulated earnings and profits, the expectation to elect REIT status, the expected timing and effect of that election and the expected timing and amount of distributions. These statements are subject to risks and uncertainties that could cause actual results to differ materially from those projected in these forward-looking statements. For additional information regarding factors that may cause actual results to differ materially from those indicated in our forward-looking statements, we refer you to the risk factors included in Item 1A of our Annual Report on Form 10-K for the year ended December 31, 2013, as supplemented by any risk factors contained in our Quarterly Reports on Form 10-Q. We caution investors not to place undue reliance on the forward-looking statements contained in this document. These statements speak only as of the date of this document, and we undertake no obligation to update or revise the statements, except as may be required by law. Commuters in Vancouver, BC can now surf the internet while they cruise around the city on public transit buses, thanks to a new campaign from TELUS and Lamar Advertising Company. 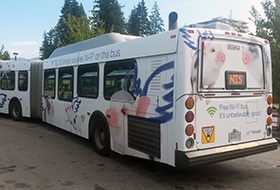 Lamar launched Vancouver’s first Wi-Fi full wrap advertisement on three public transit buses for the pilot project, which started in August and will run for the next six months.